Teutonic Tuesday: Wie der Panamera aussehen sollte, Teil 2? As I had some talk with fellow Dutch LaLD’er Section38 we talked about our 1:1’s. He drives a 928S3 and my first Porsche, way way back, was a 928S doglegged-manual. And then I thought: “why on earth don’t I have a 1/43 from that one, as I do of about anything I ever drove? But, then what am I showing you here? Well, this is the nose of an S4, which had the facelifted nose and rear from 1987. But it’s not a plain S4. Oh no. It’s one of Porsche’s attempts to create more space. To get some sort of 4-seater sports-saloon. 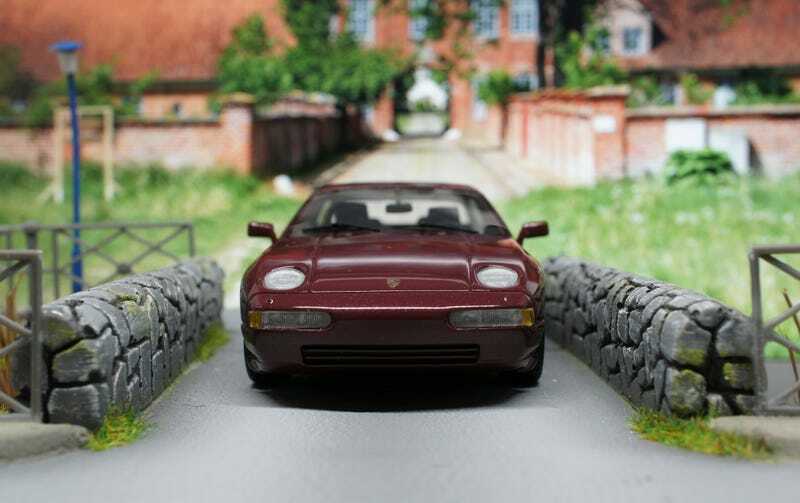 The infamous Porsche 928 H50. Well, infamous. It was totally unknown up on until presenting the car on Pebble Beach in 2012. Before that it had been in storage for 25 years at Porsche’s Studie und Prototype “vault”. It’s based on the normal S4. A lengthened chassis provided more leg room for the rear passengers (suicide RX8-style doors were added as well) and that different styled roof gave more space to store luggage. Personally I don’t find that rear too attractive but hey: It was just a study. And the study actually learned Porsche something: Just extending an existing platform to create that decent 4-seater car wasn’t enough. After 5000 miles Porsche’s engineers decided the that the chassis didn’t meet the required rigidity benchmarks, so the project was stopped. And for a 4-seater a brand new platform was needed. But after the Troutman & Barnes 911 it’s the second 4-seater Porsche in my collection. And I’m not even sure if this one looks better than the Panamera, it looks completely bonkers and for that I love it. There’s a Part 3 in it for the “Wie der Panamera aussehen sollte-series” as I’ve got another 4-seater Porsche. And that’s truly the best looking Porsche Saloon. Ever. And the real answer. That’s for another Teutonic Tuesday though. The model is another 1/43 BoS, “Best of Show’, just like the SM Opéra I showed in LaLC Car Week’s French Friday. It’s nice to see a brand even coming up with an oddball like this but it has it’s flaws. Just like that SM Opéra the windows seem to be completely “flat” instead of a bit “rounded”. And that exhaust-tip of both the S4 and the H50 never was that small/round. Or even chrome/metal-colored. So “Best of Show” is a bit relative. I just couldn’t resist when I ran into it. And I definitely want to see that 1:1 in the future. It was a test-mule so all the bodywork wasn’t that good, it clearly wasn’t designed by an artist and Anatole Lapine (head of design at Porsche when the ur-928 was penned down, the 928 which even has a connection with the AMC Pacer!) probably would have done a lot to stop this from being produced anyway. Yet I find it to be awesome. Das war meinen zweiten Geist der vergangenen Panamera. Teil 3 folgt balt. Vielleicht nicht nächste Woche, aber balt. Auf wiedersehen!